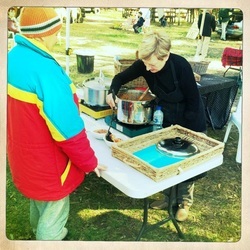 Mangrove Mountain Country Markets - Yum and Fun! On the last sunday of every month, the mountain community gets together for the country markets - a great day out for stallholders and punters alike! We have lots of regular fare including local organic fruit and vegies, gourmet goat meat, olive oil, dukkah and spices, local honey and honeycomb, organic sourdough bread, Flex and Lucky's homemade organic lemonade, Brad's vegetarian delights such as curries and samosas, local plants and organic seedlings. And of course there's the CWA jams and pickles, fresh flowers and devonshire teas (and let me tell you, those CWA ladies make a MEAN scone!!!). 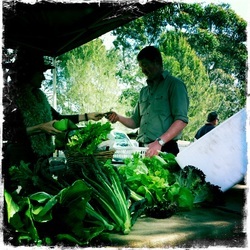 Champion Organics - Lee will hook you up with the freshest local produce! Pappa John getting a cuppa from the CWA ladies. Smiles all around! The playground and tyre swing are kid magnets! They loooooove a day in the country! Eat your heart out Pollock!